Check out number four across. 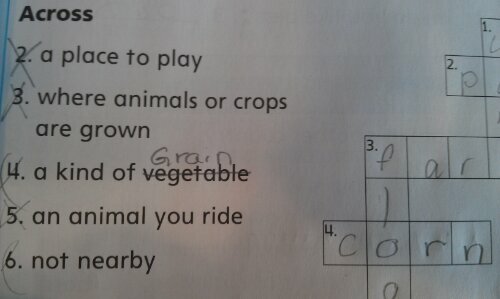 Corn is a grain. Not a vegetable. Another reason I’m glad I homeschool. And I thought I didn’t like this curriculum just because it wasn’t expansive enough in its presentation of vowel combinations. This entry was posted in GAPS, Nutritional Intervention, Odds and Ends and tagged and SCD humor, GAPS, paleo, primal, whole 30 on March 6, 2013 by thehomeschoolingdoctor.